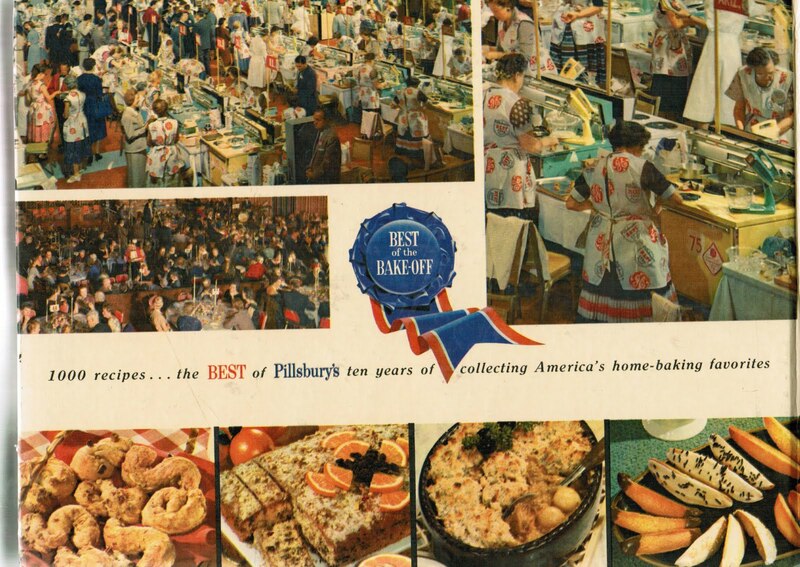 This 1959 Bake-Off book is a collector’s item. I come across it every once in awhile at antique stores, and of course, it can now be found on Ebay or Amazon. You can’t miss it because it’s not shaped like most cookbooks. It’s rectangular and also very heavy, as it has 607 pages! It doesn’t fit right on most bookshelves. 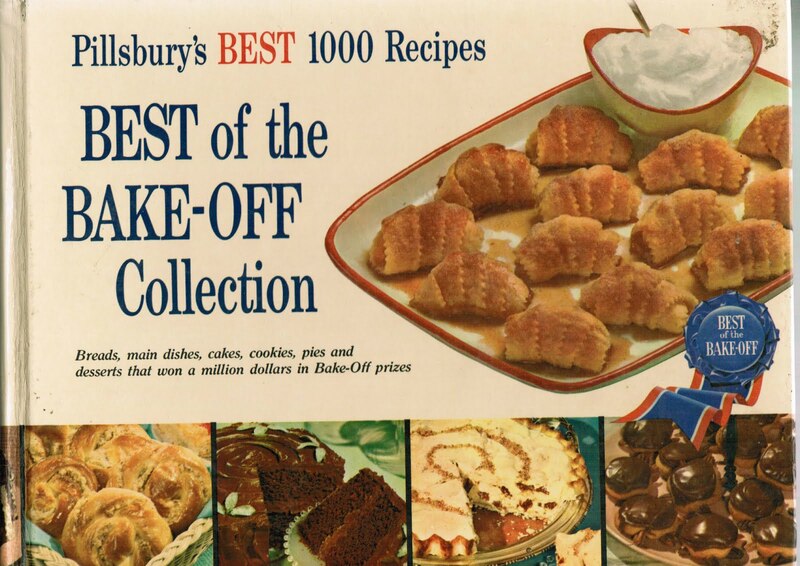 When this book was written, the Bake-Off was only 10 years into its existence. The Bake-Off, first known as the Grand National Recipe and Baking Contest, began in 1949 at the Waldorf-Astoria Hotel in New York City. 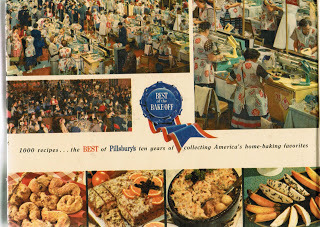 The only product cooks could use for entering was Pillsbury flour. Now, at the Bake-Off to be held this week, there are dozens of Pillsbury products from which to choose. Since the recipes all had to use flour, there are many recipes for cakes, cookies, yeast breads, pies, and some main dishes. Most of the photos are black and white, with a few color photos and illustrations. One of the color photos showcase “Peanut Blossoms.” This is the classic peanut butter cookie with the Hershey Kiss in the center. Many people don’t know that the cookie was a Bake-Off entry – and it didn’t even win! 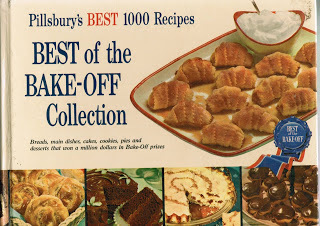 Even though it’s a vintage cookbook, I guarantee that if you love to bake, you will still find recipes you will want to try, and some off those retro ones are back in style. Also, if you are one of my dedicated readers and remember one of my older blog entries about Clementine Paddleford, you may be interested to know that she was once a Bake-Off judge! I didn’t know that until I found it in this cookbook. If you are reading this post today, Monday morning, remember that the Bake-Off in Orlando is going on right this very minute! I’m sure all the contestants are as excited now as they were back in 1959. I wish them all the best of luck!! I am on pins & needles waiting to hear the final results.